THE EARLY YEARS: Michael Ronson was born on 26 May 1946 in Hull. The first son of George and Minnie Ronson (with two younger siblings, Maggi and David), Mick was given an accordion by a neighbour when he was three, later took piano lessons and played the recorder at school and harmonium in the family church. He wanted to learn the cello, and attended violin lessons in preparation but gave up after three years. Hull was a tough city, and carrying a violin case made Mick a target of fun. He didn't play an instrument for another three years but his musical grounding had taken root. In mid-65 Ronson moved to London and joined first a band called The Voice, replacing Miller Anderson and then a Motown covers band called The Wanted before returning to his home town in 1966. One of Hull's most popular groups was The Rats, who had disbanded just before Mick left London. Singer Benny Marshall and drummer Jim Simpson kept the name and tried to find a new guitarist and bass player. Mick joined them alongside Geoff Appleby on bass. Around this time Mick also worked with Robert Palmer. THE BOWIE YEARS: In early 1970, when Ronson was employed as a municipal gardener with Hull City Council, John Cambridge came home and encouraged a reluctant Mick to come to London to play with a singer-songwriter called David Bowie. David Bowie, championed by DJ John Peel, was working on some tracks for the BBC. Mick and David met for the first time in February 1970 at the Marquee, and two days later Ronson played with Bowie on a Radio One session. Mick had come to London with his pregnant girlfriend Denise; she returned to Hull within a week and gave birth to their son, Nicholas. Bowie's latest concept The Hype, featured Ronson, John Cambridge and bassist Tony Visconti. Around this time Ronson was also enlisted by Michael Chapman to play on his debut LP "Fully Qualified Survivor". 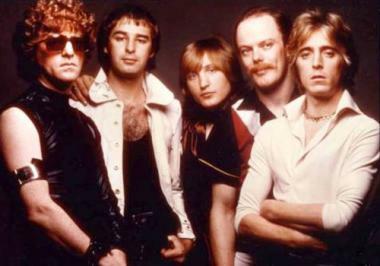 Through Michael Chapman and his producer Gus Dudgeon, Ronson played with Elton John on a song titled "Madman Across The Water". In May 1970 Bowie began recording "The Man Who Sold The World", an album largely driven by Mick's robust guitar playing. In between, Ronson returned to Hull and formed a new band, Ronno. Their only release was a 1971 Vertigo single before work on "Hunky Dory" and Ronson broadened his track record with his first string arrangements on "Changes" and "Life On Mars?". David also hired up-and-coming manager Tony DeFries who secured a new record deal with RCA. Before "Hunky Dory" hit the streets, Bowie, Ronson. 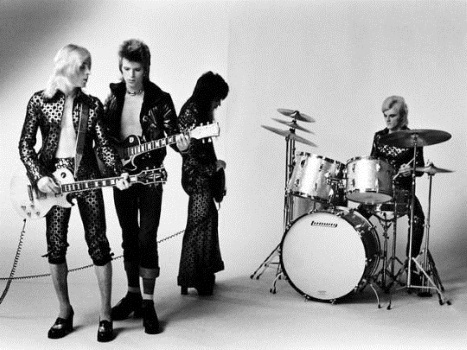 Bolder and Woodmansey were back in Trident studios recording "The Rise And Fall Of Ziggy Stardust And The Spiders From Mars", a now classic album that contained one of Mick's finest guitar work-outs; "Moonage Daydream". Suzanne Fussey became David Bowie's wardrobe mistress, hairdresser and Ronson's girlfriend and later married Mick in 1977. 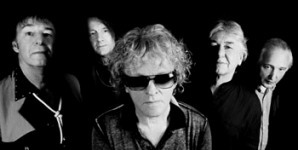 Use the site index links to navigate within the Mick section, or to check out the pages for Mott The Hoople and its band members. I welcome your comments, additions or corrections!